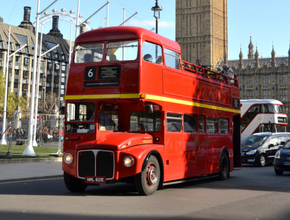 Take your seat on our beautifully restored double-decker bus and marvel at all of London’s highlights including Westminster Abbey, Big Ben, the Houses of Parliament and the London Eye. What better way to see the highlight of London than from on boards a vintage double-decker bus? 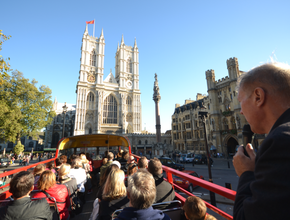 Enjoy great views of Westminster Abbey, Big Ben, the Houses of Parliament and the London Eye as we meander through the streets and history of our great city. 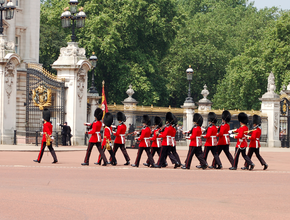 Join us at the Tower of London that was built nearly a thousand years ago and is now home to the Crown Jewels protected by the famous Beefeaters. The imposing former palace was once used as a fortress and a prison and you can see Traitors Gate where prisoners entered the Tower for the last time! We stop for photos and a history lesson from the guide before our cruise.